Complement your service reviews with product reviews and help your customers make decisions about which products to buy. 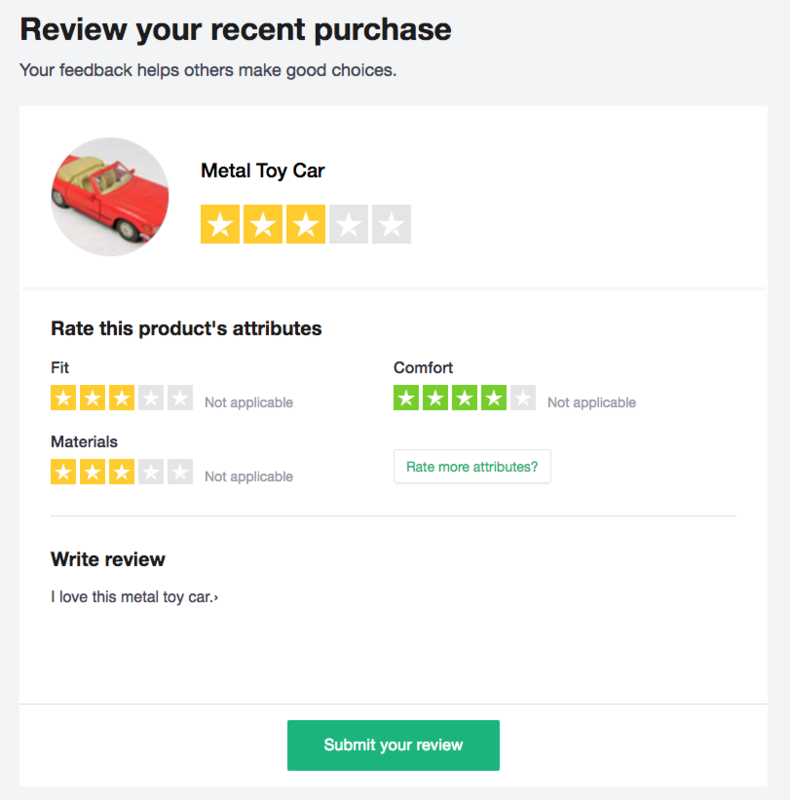 Implement Trustpilot's Product Reviews directly on your product web page to give customers the opportunity to review and rate the products they've purchased. Product Reviews help new customers make informed buying decisions, while giving you valuable product insights. Are Product Reviews available in all languages? Yes. Product Reviews are available in all of the languages that Trustpilot supports. How do I invite customers to leave a product review? These are a few ways to invite customers to leave a product review. Invite customers from your Business Portal, create a custom integration by using our APIs, use AFS, or use one of our eCommerce integration applications. Manual invitations In Trustpilot Business, follow the instructions to send your invitations manually. API Send API-links to your customers via an email tool, for example, MailChimp. You can also invite customers using Trustpilot’s invitation tool — customers are asked to write a service review and then redirected to a product review request form. Can I control when my product review invitations are sent out? Yes. If you use our APIs or Automatic Feedback Service, you can schedule both the date and the time that the product review invitation should be sent out. Can I import non-Trustpilot product reviews to Trustpilot? Yes, you can import your non-Trustpilot product reviews to Trustpilot. How do I share product reviews on my website? Share your product reviews on your website by integrating one or more of our product-geared TrustBoxes, or integrate reviews directly from our APIs. For SEO purposes, we recommend using our Product Reviews SEO TrustBox. Can I share my product reviews on social media? Yes. Share your reviews on Facebook, Twitter, and LinkedIn. In Trustpilot Business > Product Reviews > Product Reviews, find the review that you want to share. Click the Share button, then select the channel where you want to share the review. Can anyone write a product review? For now, customers can only write product reviews if you send them an invitation. Should I show product reviews on my website? We don't show product reviews on Trustpilot.com, so we recommend that you display them on your website. To implement product reviews on your website, use either a product-enabled TrustBox or Trustpilot APIs. What does the Product Review form look like? Where can I read my product reviews? Find your product reviews on the Product Reviews page in the Trustpilot Business application. How can I integrate both my Trustpilot and non-Trustpilot product reviews? You can use the Product Reviews MultiSource TrustBox to easily import and showcase all reviews for a given product. Do product reviews have SEO benefits? Product reviews are not published on Trustpilot.com, so to gain SEO benefits from your product reviews, display them on your website with our Product Review TrustBoxes.